(NaturalNews) Many studies have shown that beetroot juice can improve athletic performance. Now, a study conducted by scientists at Kansas State University and published in the Journal of Nitric Oxide, Biology and Chemistry has shown that the beverage could also provide an important quality of life boost to people suffering from heart failure. "Remember, for every one football player in the United States, there are many thousands of heart failure patients that would benefit from this therapy," researcher David Poole said. "It's a big deal because even if you can only increase oxygen delivery by 10 percent, that can be the difference between a patient being wheelchair-bound versus getting up and walking around and interacting with his or her family." Prior research by the same team, published in the journal Physiology in 2013, showed that due to its high nitrate content, beetroot juice increases blood flow to skeletal muscles that are engaged in exercise. This, in turn, increases the oxygen flow to those muscles. In the new study, the researchers found that, after drinking beetroot juice, participants experienced a 38 percent increase in blood flow to their skeletal muscles while exercising. Significantly, blood flow increased most to the fast-twitch muscles that are used for explosive running. These muscles are typically less oxygenated than other skeletal muscles. The increased oxygen flow would be enough to significantly improve quality of life in heart failure patients, the researchers said. "Heart failure is a disease where oxygen delivery to particular tissues, especially working skeletal muscles, is impaired, decreasing the capacity to move the arms or legs and be physically active," Poole said. By enabling heart failure patients to get more exercise, beetroot juice could be the first step in producing deeper, more permanent health improvements. "The best therapy for these patients is getting up and moving around," Poole said. "However, that is often difficult. Increasing the oxygen delivery to these muscles through beetroot can provide a therapeutic avenue to improve the quality of life for these patients." The researchers have already begun a clinical trial to directly test the effects of beetroot juice in heart failure patients. The research is being conducted in collaboration with the University of Exeter and is funded by the National Institutes of Health. 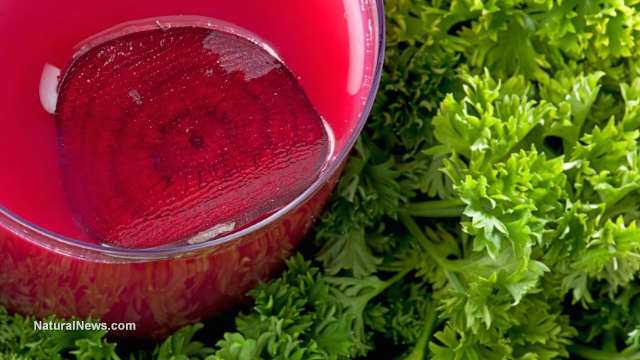 Why does beetroot juice have such a dramatic effect on blood flow? The answer lies in the drink's high concentration of a chemical known as nitrate. Indeed, just 70 milliliters of beetroot juice contains as much nitrate as 100 grams of spinach. In the body, nitrate is transformed into nitrite, which has been shown to help protect blood vessels from injury. The nitrite is eventually transformed into nitric oxide, which dilates blood vessels and thereby increases blood flow. Because more oxygen is delivered to muscle cells, these cells are therefore able to produce more power and perform for longer without tiring. Beetroot juice has been shown to increase both speed and endurance in athletes. For example, one study found that athletes who drank beetroot juice used 19 percent less oxygen and performed for 17 percent longer. Another, published in the journal Medicine & Science in Sports & Exercise in 2011, found that cyclists who drank beetroot juice completed a track faster than cyclists given a placebo. A pair of similar studies, conducted by researchers from Maastricht University Medical Centre in the Netherlands and published in the International Journal of Sport Nutrition and Exercise Metabolism in 2012, found that consumption of beetroot juice improved not just the cyclists' speed but also their power output.